Basil (Ocimum basilicum) is also known as Albahaca, American Dittany, St. Joseph’s Work, Witches Herb, Our Herb, Feslien, Balanoi, Njilika and Sweet Basil. It has many different varieties depending on how it is used. 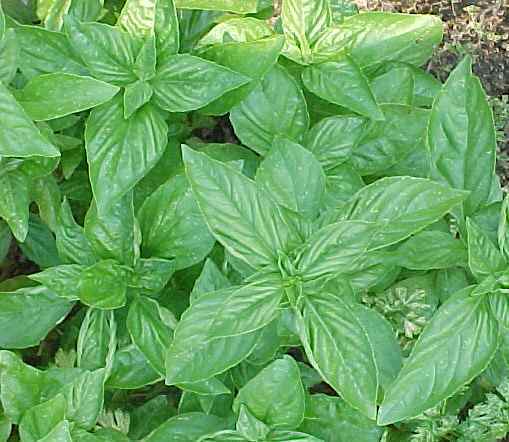 For example, in Italian cooking, sweet basil is used. In Asian cuisine, lemon basil, Thai basil and holy basil are used. It is native to Iran and India and is also known in Asia, where it has been grown for over 5,000 years. The word Basil derives from the Green “Basieus”, or King. It was thought to be found growing where St. Constantine and Helen discovered the Holy Cross. It has long been associated with nobility and royalty. Basil can be used as ingredients in magickal food spells. Put your energy of the spell into the ingredients and serve happily. Sweet Basil can create sympathy between people so it was thought to help quell anger and arguments. It is also used in love incenses and love divination. For example, if you place two basil leaves on coal, it can predict how harmonious a relationship will be. If the basil burns quickly and is together, it will be happy. If it flies apart, then the relationship will be full of conflict and not favorable. If it burns slowly or crackles, the couple may stay together but it will be a rough road. If a business is trying to attract customers, place Basil in the cash register or on the window sill. It can also be carried in the pocket to attract money and abundance to you. It is that wherever Basil sits, no evil can wander in. Therefore, Basil is used in protection spells, especially on the floors on homes. Use a small amount Basil in every room if this is the intended use. Basil can also be given as a gift as good luck for a new home. There is lore that Witches would drink a half cup of Basil juice before flying off into the air. If you work with Dragons (especially Basilisk), Salamanders and other mythical creatures, Basil can be used to invoke them. People use it as incense or tea to invoke these creatures. It is also used when being initiated to release fear in the next step of spiritual growth and also releases fear of psychic experiences. Finally, Basil is used in rituals with death and dying. It can be burned as incense or also offers protection when someone is transitioning into the Otherworld. Remember, this is not a substitution for medical advice so always check with a medical professional to make sure working with herbs or oils are safe for you.